Hentown Mama: "Fringe Hours" is RELEASED! It's FINALLY here!!!! Today is the day that "The Fringe Hours" releases! I have loved this book and all the lessons that I gained from it. Jessica Turner from The Mom Creative is an amazing writer. 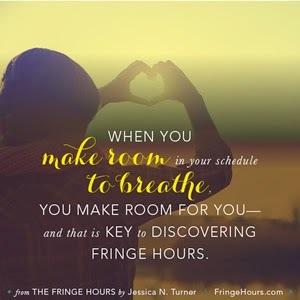 Fringe hours are those minutes that we tend to waste while waiting in line at the doctors office or sitting in our cars for car pick up (or even traffic). The goal is to find those hours in your day and make them time for you. If you are like me and love to read then always keep a book in your bag. The Nook and Kindle apps are great for this too because then you have books on your phone. If you like to write notes to friends on actual notecards then keep some in your purse and while you are waiting in line somewhere or waiting on your food to come out at a restaurant write a note. Back when I first started getting sick with those fun kidney stones, I had a ton of thank you notes to write for work. One afternoon I decided to go to the doctor. During my 2 hour wait I wrote all my thank you and finished reading this book. I am so excited that this book is now available to EVERYONE. And I get to tell you that it's also the FINAL (sadly) book selection for the BLOOM Book Club at (in)Courage. If you want to find out more about how to join the book club then click HERE. 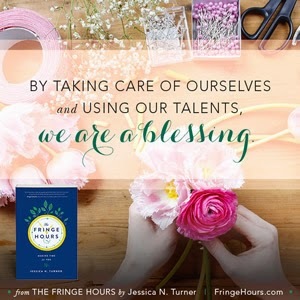 And if you want more information about the book or Jessica Turner then head over to The Mom Creative or The Fringe Hours page on Baker Publishing.